Dome Miniature Nativity 1 features the Adoration of the Magi and measures just 3.5 inches wide x 4 3/8 high x .75 deep. Dome Miniature Nativity 1 features just two levels, making assembly simple. The roof, shown extending on either side of the façade, is optional. The Dome Miniature Nativity 1is reminiscent of the Heureux Noël Miniature Nativity with which it shares its beautifully drawn figures. 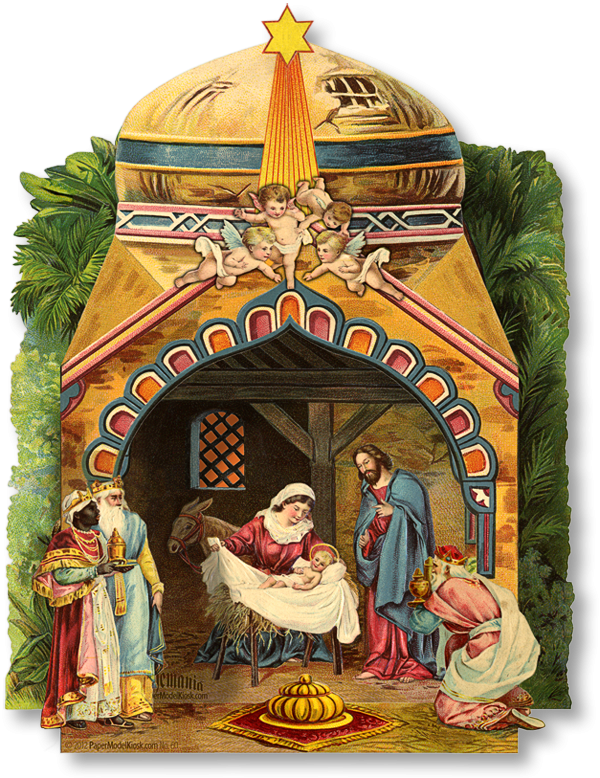 But the schoolhouse-like manger of the Heureux Noël Miniature Nativity is here replaced by a domed middle Eastern manger topped by a six-pointed star.An arched, brightly decorated entrance, reveals the Nativity. Above, four little angels seem to have just tumbled down from heaven, and below Magi offer gifts to the Newborn Child. A mullion manger window glows with orange vellum, and the green of palms and trees surrounds the manger. 1. The side walls of the façade are folded back (after cutting along the left and right Magi). 2. The side walls tabs are inserted in the Manger slots and the floor tabs are attached to the inside of the front. 3. The roof is optional, and attached between the front and manger. Complete step-by-step instructions are included with your PDF Premium Download, but you probably won't need to read a word to assemble the Dome Miniature Nativity 1. Size: 3.5 x 4.37 x 0.75 inches. 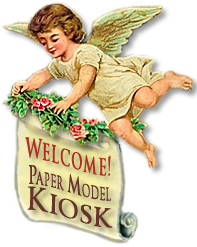 Buy Dome Miniature Nativity 1 as part of a collection, and save!